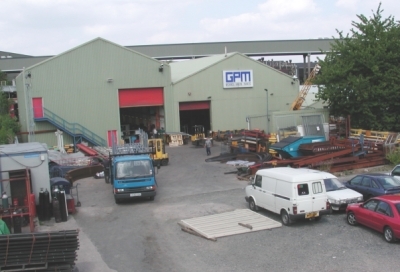 GPM Engineering Ltd is situated on the A38 Bristol Road South between junction 4 of the M5 motorway and Longbridge. 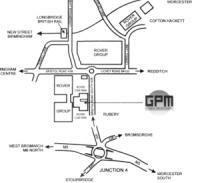 Our two sites are easily accessible from both the M5 and the M42 motorways, a central location allowing direct routes to most of the UK. Click here to see our location on multimap, where more road names and directions are available. 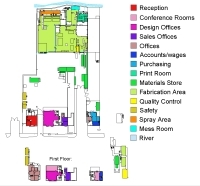 The buildings are within 15mins walking distance from Longbridge rail station, on the cross-city line. Trains run to and from Birmingham New Street station every 15mins approx. 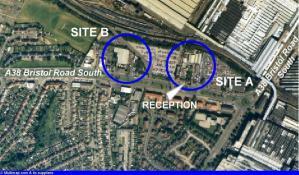 The GPM site is split into two main areas about 100m apart, on the Bristol road: site A and site B.